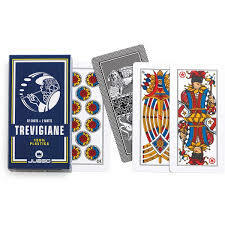 One way you can tell what region an Italian is from is by the playing cards he or she uses. 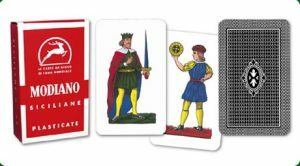 There is a variety of decks that each represent a region of Italy. A major difference from the playing cards used in America is the number of cards. Unlike the 52 card deck, most Italian decks have 40 cards. The numbers go from 2 to 7 and then there’s the Jack (Fante), the Queen (Donna), the King (Rè) and the Ace (Asso). In the north west of Italy, you will find the same four suits you have in America: clubs (fiori), diamonds (quadri), spades (picche), and hearts (cuori). These suits are often referred to as “francesi”. The cards used in most of the rest of Italy, have a unique set of suits. While they are depicted differently from region to region, the names of the suits are the same: bastoni (sticks), denari (coins), spade (swords), and coppe (cups). For anyone familiar with Tarot cards, these are the same four suits. Another regional variant is in the types of face cards. Many decks, instead of a Queen card, have a Knight card (Cavallo). The night is often depicted on a horse, making the “cavallo” card easy to recognize. 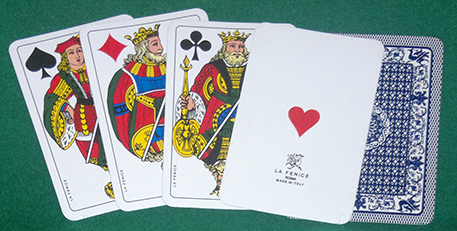 One of Italy’s most famous card games is Briscola. This game is played with a 40 card deck (remove the 8s, 9s and 10s, if you’re using an American deck). The cards in this game rank, from highest to lowest, Ace, Three, King, Queen/Cavallo, Jack, then Seven on down. The Three in this game is the card to remember because it’s high ranking it not in line with numerical nor traditional order. Come learn the rules and play a tournament of Briscola at Sentieri!